Canine allergy in general is an abnormality of the immune system, which occurs in response to certain factors called allergens. These allergens exist in the environment, food, parasites, fungus and represent that a dog has a hypersensitive immune system. These allergens trigger an immune response, which can be termed as a mild to severe inflammatory response. 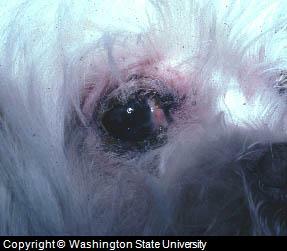 Eye allergy in dog are thus caused by allergens in the environment, food and microbial growths. Some dogs may be hypersensitive, thus their immune system may respond abnormally, causing an allergic reaction in different parts of the body, including the eye. Eyes are sensitive organs, which may be affected by environmental and other factors due to the rich nerve supply and high ratio of blood vessel distribution. Allergens may enter into the eye through the environment in the form of dust, debris, pollen or any other form. Similarly, dog food can be another source of allergens; some dogs may be hypersensitive towards food ingredients such as dairy products, additives and corn etc. all of which can cause an allergic response. Flea bites can also cause an immune disorder, which occurs when a histamine like substance enters into a dog's body from the flea bites. It should be remembered that flea bite allergy usually affects the skin, therefore eyelids are more prone to this type of allergy. Insect bites, such as those caused by wasps and bees are other causes of allergy eye dog problems, causing the typical symptoms and a clinical form of allergy. Clinically, dog eye conjunctivitis or inflammation of the conjunctiva is the most common exhibition of dog eye allergies. Typical symptoms include swelling, redness, transparent excess tear discharge and irritation. Mild pain might exist, as the result of a dog that may scratch or rub its eyes, which may lead to self injury, causing secondary complications such as trauma to the surface of the eye and/or bacterial infections. Dog eye allergies can be clinically differentiated from other conditions; allergies are usually identified by mild to severe eye swelling, transparent/clear discharge with no pus or cloudiness and severe irritation. Pain may or may not be present depending upon the condition. Dog eyes should be examined closely and ophthalmic procedures should be carefully applied since it is possible to confuse allergy dog eye with other dog eye conditions. This is because complications that are the result of the mild form of some conditions resemble dog eye allergies. An incorrect diagnosis can become problematic for the dog during the later stages of disease, possibly resulting in the partial to complete loss of eye function, i.e. blindness. A differential and confirmatory diagnosis can be achieved through sensitivity testing to different allergens, food-ingredient elimination techniques, and tear tests. Additionally, in dogs suspected to have a secondary infection, the dog eye discharge can be cultured for microbial growth. A Fluorescein Test can be conducted for a dog eye ulcer in cases where there are signs of any injury or scratches. Allergy dog eye of any kind can be treated with anti allergy drugs (anti histamines), but these drugs can only reduce the severity of the condition by temporarily depressing any inflammatory response caused by the allergens. This is the most effective approach, but cannot be termed as a specific treatment for canine eye allergies. Allergens or causative factors should be removed, in order to resolve the condition. Eye allergy in dog can re-occur if the underlying allergens are present. Along with the use of anti allergy drugs, dog eyes should be cleaned regularly (at least twice a day) with an isotonic solution such as PNP Dog Eye Wash, also be sure to keep the surface of the eye clear. In addition to cleaning the dog eyes, anti-oxidants should be used. Naturally occurring anti-oxidants are an effective way to eliminate any possible toxins and allergens in the body. Anti-oxidants also improves cellular integrity (strength). Look for a natural product such as C-Caps. To soothe the eyes and support general dog eye health, consider using a natural product such as Eye Heal. Other products, such as I-Clenz, can also be used to remove tear stains, support eye health and soothe areas near the eyes. Removal of allergens or possible supportive factors to allergy is an effective approach in controlling recurring dog eye allergies. Sensitive dogs should only be fed with simple foods, preferably with no dairy products, additives and corn products in it. Additionally, dogs should be kept indoors and protected in dry and allergenic seasons and eyes should be cleaned regularly, preferably once in a week in dry season.